Out of the many tartans available, Black Watch is undoubtedly one of the most popular. But how did this particular tartan come to exist? Here we reveal the story behind the iconic cloth from past to present. The Black Watch saw action in the French wars (1745–1815); battles of the Empire (Crimea, Indian Mutiny, Egypt, Sudan, Boer War); First World War; Second World War; and (post Second World War) saw action in Korea; carried out peace-keeping duties in Kenya, Cyprus and the Balkans; and took part in the invasion of Iraq (2003–4). Since 2006, the Black Watch have been the 3rd Battalion of the Royal Regiment of Scotland. 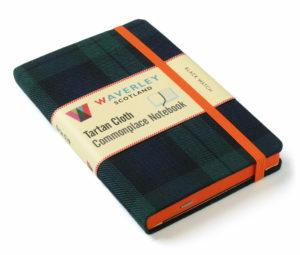 The Waverley Genuine Tartan Cloth Commonplace Notebook in Black Watch is out now priced £9.99. The tartan cloth for the notebook is supplied by and produced with the authority of Kinloch Anderson Scotland, holders of Royal Warrants of Appointment as Tailors and Kiltmakers to HM The Queen, HRH The Duke of Edinburgh and HRH The Prince of Wales.